This is the cover for the latest chapter of the monthly Madlib series we've been blessed with this year, Medicine Show #8: Advanced Jazz. 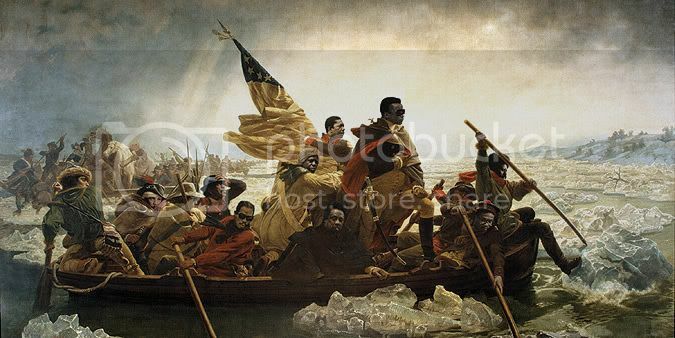 The painting is called "Jazzcats Crossing the Hudson" and features jazz pioneers like Miles Davis, John Coltrane, and Sun Ra as they make their way towards New York City. Read more about the cover here. The album is an 80-minute mix of jazz from the last 40 years with Madlib at the turntables throwing in his usual obscure skits and sounds in between the carefully chosen jazz records. * Since receiving this album last week I haven't listened to anything else, just letting it repeat over and over. I've never been a huge jazz fan but with my growing interest for the multifaceted Madlib, especially this year, my audio tastes have witnessed a very pleasing expansion of horizons. The previous Medicine Show, an album of Madlib's original jazz music called High Jazz, helped evolve my ear drums to the richness of this musical genre (although, I should point out that much of Madlib's jazz stuff seems to transcend the limits of any genre except maybe "cosmic music," if there is a such thing). I will have a double review of the Medicine Show's Summer of Jazz written soon but for now I'm still soaking in the sounds of Miles, Pharoah, Herbie, Mingus, and more. I suggest you do that too. You might learn something.